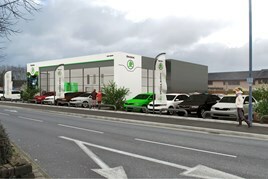 RRG Group has had its plans for a new town centre Skoda dealership in Bolton given the green light. At least 30 full-time jobs and five part-time jobs are expected to be created by RRG Group’s new facility after the group’s planning application was given the go-ahead by councillors at planning committee. The dealership will now be built at a prime location on the north side of town, where St Peter’s Way and Topp Way meet, a position described by the authority as “a key gateway site into Bolton town centre”. The new development will create a car sales showroom, workshops for servicing, and mezzanine office space covering 917 square metres. RRG already undertake service and repairs for Skoda at their site on Bury New Road and this new site will add new and used car sales to their operations. Leader of Bolton Council, Cllr Cliff Morris, said: “This is major private investment at a prominent gateway site, which will create at least 35 to 40 new jobs for local people. RRG Group was formed in Bolton in 1967 when the business consisted of a workshop, in Radcliffe Road, Bolton, with five mechanics and a petrol pump which sold 400 gallons of petrol per week. The group now has centres across the North of England representing seven manufacturers: Skoda, Toyota, Lexus, Peugeot, Mazda, Nissan and Kia. RRG managing director, Arran Bangham, said: “Having started our business in Bolton 50 years ago, we are excited to be able to expand in our home town. “We have an excellent reputation with the manufacturer, with our Rochdale dealership being awarded Skoda Retailer of the Year for two consecutive years. “We will operate our new centre to the same high standard, provide excellent customer service and work closely with the neighbouring businesses. We are delighted to be bringing job opportunities to the town and providing a stunning new development at this key location." Hindley Lawrence, property advisors to the motor trade, represented RRG on the acquisition of the land.